I am a hunter and camper from West Central Ohio. Looking forward to using the Auspit all of the time this fall. Whole chickens, pork roasts, ribs, beef standing rib roast, prawns...you name it, I'll cook it! I'm an avid fisherman from Pennsyvania. I met Jon, the sales rep for Auspit at the Pennsylvania RV show. We talk and I thought that I might be able to use the Auspit during next year’s ice fishing trip to the northern tip of Lake Champlain.We have a group that meet every year on Washington’s birthday to ice fish together. With a small sledge hammer the main shaft could be driven into the ice which in February is over 25 inches thick. Then build a nice fire and put on the venison or Moose roast and let it go until done at lunch time. I promised to send photos cooking on the ice to Jon. I did purchase a unit and tried it out last weekend with a nice lamb roast. It came out perfect. I still can't believe that the batteries will last 20 hours. I will not take a chance and have an extra set for ice fishing when the cold may affect the battery life. Glad to have you join us here! I am truly looking forward to those ice fishing rotisserie pictures. 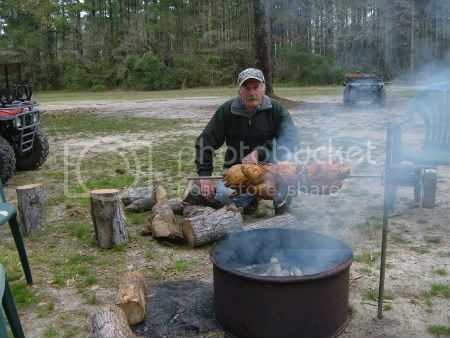 I thought of you when I came across this picture online the other day: http://cookingadventures.shutterfly.com/37 because I can only imagine your encampment being like that but colder. Be sure to check out the comment below the picture. These are our people! I need to let them know that if nothing else we can improve their beer warming experience with one of the Spitmate rotisserie baskets. You won't want to overheat it on one side, right? BTW, you mentioned that you have a tough time believing that the batteries will run 20 hours. I suppose you are referring to ice fishing conditions? I haven't tried it, so I cannot speculate, but ordinarily they should run over 90 hours on just the the D's. Anyway, welcome again to the forum! Hello, im a hillbilly from sydney australia and i love camping and out door stuff. i only just tried my auspit for the first time on new years and it worked great. I cooked a couple of kilos of pork leg and veal and it was awesome. here for some more ideas for my next adventures. P.S. a think a battery powered electric carving knife would be so cool when cutting up stuff on the spit, does anyone know if they exist or where to buy one? Glad to have you join us here! It sounds like you are off to a delicious start. I have not seen a battery powered carver as of yet, but I will keep my eye out for one for you. Speaking of adventures, I am currently bouncing around Madagascar for a bit of fun. I am reminded of Australia as they have quite a bit of imported eucalyptus here which is grown primarily for use in cooking as charcoal or just burning the wood directly. That is how the majority of people cook here. I will post a picture later when I can of one variation I saw of rotisserie over this magnificent cooking source. They have a delicious local cattle here called zebu. It is the humpbacked variety and is said to have arrived here from India a long time ago by way of the African continent. Let me tell you, it is DELICIOUS. Sure, the flavor is enhanced by being cooked over this fuel source, but there is more to the flavor than that alone. I am sure the grasses they are eating and the way they are being raised also contribute to the flavor. Still...if I had only brought an Auspit with me! I would love to try out zebu over eucalypt with an Auspit. It would have to be to die for. Here is the photo I promised about one version of rotisserie I saw in Madagascar. This was at a small village on a road in the middle of nowhere in a place where trucks and busses stop for a bite to eat. Some guys had built a fire just off the side of the road. It was interesting to see that they made their cooking fire much how I like making mine. They have their main fire for warmth and then fed the coals off to one side which they used to cook their skewers, which they rotated manually. You can see they have their dutch oven at the ready as well. This goes to show that fires and food bring people together the world over. I live in Yellowknife, NT, Canada. I have a manual rotisserie I bought from Cabelas a few years ago and love it. It takes to many beers to sit there and cook so when I saw the Auspit I ordered it the same day. I met you at the Fred Hall show in Long Beach, CA and have sent the description of this awesome product to my Dad so we can set one up in the mountains of Colorado at the family cabin. I will be headed out to the cabin in June or July of 2010 to build my firepit on site, and I will be setting things up so the Auspit stake can be mounted to one side. The thought of using pine logs cut from the forest behind the cabin to cook incredible meals is already making my mouth water! I will also be purchasing one of these for my personal use wherever I live, and I will make sure to pick up the FireTrough so I can cook meals wherever I camp. Are there any possible discounts for purchasing more than 1 unit at a time? Are there any dealers located in Southern California or Denver, CO? Thanks again for showing me this great product, I cannot wait to purchase one (or more)! New here. Just bought an auspit at the Orlando Trade show. Can't wait to use it!! G'day Extort and welcome to the forum! I'm glad you told me ahead of time that you would be registering with that handle as I would have been a bit nervous otherwise. Let me respond to a couple of things you brought up. Well, I hope to not put a damper on your plans, but the idea of cooking over pine may not be a good one. I haven't tried it myself because many people recommend against it. Apparently there are a lot of resins in a soft wood like this which can leave unpleasant flavors and possibly toxins. 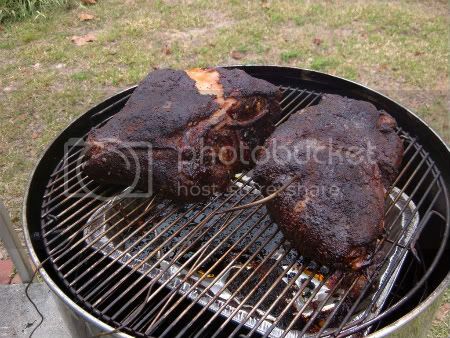 Here is one article that discusses cooking wood selection: http://www.firepit-and-grilling-guru.com/best-fire-wood.html. Does anyone have any scientific data on this? I am working off hearsay at this point. In Madagascar, I heard one anecdote relating to pine in this land where probably 90% of people cook on charcoal for all their meals. The charcoal salesmen are known for mixing pine and eucalyptus woods. To avoid getting pine, one gentleman would always ask around to the charcoal sellers for a charcoal that was 100% pine. He would keep going until he found one that would insist that he could not sell him theirs because it was 100% eucalyptus. Then he would buy theirs. So in summary, hopefully you have other woods available to you up at that cabin because I am sure it is a great venue for using an Auspit rotisserie. We have yet to implement a formal "Friends of Auspit Friends" program, but your note is a kick in the pants for us to take a look at the idea further. I'd like something that rewards fellow Auspiteers for helping us get out the good word, but doesn't overwhelm us administratively. For now, get in touch with me offline when you are ready. Not as of yet, but stay tuned as I just came out of a BBQ trade show where there was considerable industry interest in Auspit. Thanks for joining us at the forum! I look forward to seeing what you cook up there in Florida. 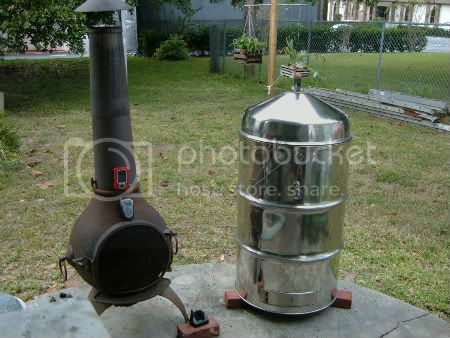 If you get a chance, please post a picture of your impressive UDS (Ugly Drum Smoker) so people here in the forum who are not familiar with it can see that work of beauty. Many people ask me about how to best modify a unit like yours or other smokers so that they could use their Auspit in/with it. While I am writing, I owe you a Beer Holster as I was out of them there at the end of the show. Just give me a heads up when you order any accessories and I will be sure to throw one in. As soon as I figure out how to post pics I'll post one of my drum. Nice meeting you at the show. I will be using it in a couple of weeks. Tom, my friend that you also met, and I are going to his hunt camp and will be taking both units and putting them to the test. Don't really know when I will be getting extra goodies though. OOPs, last post I didn't add stuff. OK here is a pic of my SS UDS (55 gallon drum smoker).